Obamacare: Senate Republicans propose amendment to delay health care law. The partial collapse of the Obamacare repeal campaign is one of the invisible stories of this Congress. At the start of 2011, Congress was flooded with repeal bills, House Republicans voted on one (accidentally giving air cover to endangered Democrats, who would use their “no” votes in campaign ads), and there was a hellraising effort to defund Obamacare in the continuing resolution. This year has been different. Republicans have hacked away at Obamacare when they could, when the media wasn’t looking. (By “media” I mean “anyone who isn’t Sarah Kliff or Jeff Young.”) They struck funding for co-ops, for home care. They have the medical device tax in their crosshairs. In the meantime, they passed a continuing resolution in the House while ignoring Tea Party demands to defund Obamacare. And here comes Ted Cruz and Mike Lee to blow things up. [S]ome Senate Republicans are proposing an amendment to delay funding the implementation of Obamacare — and they are threatening to stop the entire continuing resolution process unless their amendment is given a vote. 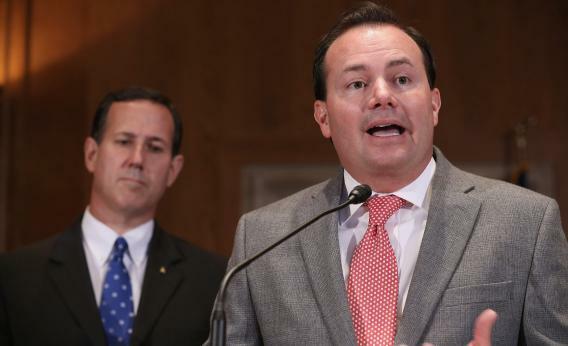 The amendment is the work of Texas Republican Sen. Ted Cruz, joined by Utah Republican Sen. Mike Lee. “I intend to object to consideration of any continuing resolution that does not include a vote to delay funding of Obamacare,” Cruz said in a press release Wednesday. In an interview with Hugh Hewitt, Marco Rubio swung behind this amendment for reasons similar to Cruz and Lee. I think you can anticipate this argument next week, and I think it’s a perfect opportunity for us to have a debate once again on Obamacare. I don’t think there’s been enough attention paid to it. It’s been awhile, we’ve moved onto these other issues, but there is, right now out there, probably nothing more damaging to our economy in the short term than this implementation of Obamacare. Rubio’s ploy is easy to understand. He’s trying to push through an immigration reform bill that’s anathema to Republicans. His most famous co-sponsors, John McCain and Lindsey Graham, spent yesterday attacking Rand Paul for a filibuster that the base embraced immediately. So he needs to get behind the occasional stunt.